WHAT: Approximately 80 rising Missouri high school sophomores, juniors and seniors will participate in the legislative process during the Emerging Leadership Conference, which is co-sponsored by the University of Missouri Division of Inclusion, Diversity & Equity and the Missouri Legislative Black Caucus Foundation, Inc. Participants will learn about 10 bills from the current Missouri legislative session. They then will select three of the bills to debate on the Capitol floor. 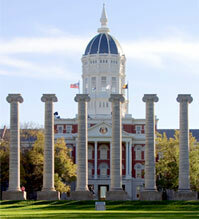 Students will be housed on the Mizzou campus and will work closely with university administrators, professors, doctoral and undergraduate students, and state legislators throughout the three-day program. The conference also will feature a college preparation workshop led by Mizzou Admissions, a campus tour and student-mentor advising sessions. NOTE: If media wish to attend these events, please contact Liz McCune, mccunee@missouri.edu, at least 4 hours before the event begins.